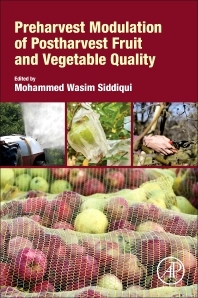 Preharvest Modulation of Postharvest Fruit and Vegetable Quality is the first book to focus on the potential yield quality, quantity and safety benefits of intervention during growth. Of the many factors responsible for overall quality of produce, about 70 percent comes from pre-harvest conditions. Written by an international team of experts, this book presents the key opportunities and challenges of pre-harvest interventions. From selecting the most appropriate growing scenario, to treating plants during the maturation process, to evaluating for quality factors to determine appropriate interventions, this book provides an integrated look at maximizing crop yield through preventative means. In fact, with the very best of postharvest knowledge and technologies available, the best that can be achieved is a reduction in the rate at which products deteriorate as they progress through their normal developmental pattern of maturation, ripening and senescence. Therefore, it is very important to understand what pre-harvest factors influence the many important harvest quality attributes that affect the rate of postharvest deterioration and, subsequently, the consumers’ decision to purchase the product in the marketplace. Dr. Mohammed Wasim Siddiqui is an Assistant Professor and Scientist in the Department of Food Science and Post-Harvest Technology, Bihar Agricultural University, Sabour, India and author or co-author of 30 peer reviewed journal articles, 18 book chapters, and 18 conference papers. He has five books (four edited and one authored) books to his credit published by CRC Press, USA, Springer, USA, & Apple Academic Press, USA. Dr. Siddiqui has established an international peer reviewed journal, the “Journal of Postharvest Technology.” He has been serving as an editorial board member of several journals. Recently, Dr Siddiqui was conferred the Young Achiever Award 2014 for the outstanding research work by the Society for Advancement of Human and Nature (SADHNA), Nauni, Himachal Pradesh, India. He is an Honorary Board Member of the SADHNA, Nauni, Himachal Pradesh, India. He has been an active member of the organising committees of several national and international seminars/conferences/summits.